Easily Digestible - Readily digestible proteins, carbohydrates and fats for optimal nutrient absorption. Prebiotic Fibers - Help balance and support healthy microflora for overall gastrointestinal health. 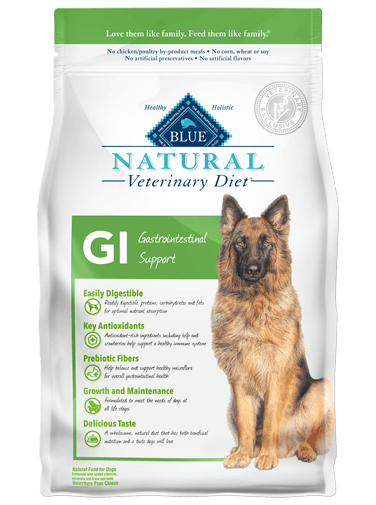 Growth and Maintenance - Formulated to meet the nutritional needs of dogs at all life stages. Deboned Chicken, Chicken Meal, Oatmeal, Brown Rice, Peas, Potatoes, Dried Egg, Natural Flavor, Flaxseed (source of Omega 3 Fatty Acids), Canola Oil (source of Omega 6 Fatty Acids), Pea Fiber, Apple Pomace, Dicalcium Phosphate, Salt, Dried Kelp, Pumpkin, Dried Cranberries, Calcium Carbonate, Dried Chicory Root, Dehydrated Alfalfa Meal, Potassium Chloride, Potato Starch, DL-Methionine, Caramel, Vitamin E Supplement, Choline Chloride, Zinc Amino Acid Chelate, preserved with Mixed Tocopherols, Iron Amino Acid Chelate, L-Ascorbyl-2-Polyphosphate (source of Vitamin C), Blueberries, Barley Grass, Parsley, Yucca Schidigera Extract, Turmeric, Oil of Rosemary, Copper Amino Acid Chelate, L-Carnitine, L-Lysine, Manganese Amino Acid Chelate, Nicotinic Acid (Vitamin B3), Calcium Pantothenate (Vitamin B5), Taurine, Biotin (Vitamin B7), Vitamin A Supplement, Dried Yeast, Dried Enterococcus faecium fermentation product, Dried Lactobacillus acidophilus fermentation product, Dried Aspergillus niger fermentation extract, Dried Trichoderma longibrachiatum fermentation extract, Dried Bacillus subtilis fermentation extract, Ferrous Sulfate, Thiamine Mononitrate (Vitamin B1), Riboflavin (Vitamin B2), Zinc Sulfate, Vitamin D3 Supplement, Vitamin B12 Supplement, Pyridoxine Hydrochloride (Vitamin B6), Calcium Iodate, Copper Sulfate, Copper Amino Acid Chelate, Manganese Sulfate, Folic Acid (Vitamin B9), Sodium Selenite.